Comprised of Austria, Czech Republic, Germany and Hungary. These countries have shared similar culture and history throughout the ages and have so much to offer. Beautiful scenery, Alps, lakes, charming villages and so much more! This beautiful area in the very heart of the land mass of Europe includes Austria, France, Germany, Italy and Switzerland. Geneva is a gorgeous city, one that`s filled with mountains of chocolate, some incredible history and a cosmopolitan atmosphere. The city boasts breathtaking river, lake and mountain views and international flavor as a result of being headquarters for a number of multinational corporations and associations. Surrounded by the Alps to the south, the city is a perfect place to begin your adventure in Switzerland. Combine Geneva, Lausanne and Montreux with the ICE and IR trains. Make the most of your vacation package through Europe! 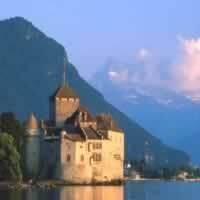 Combine Zurich, Lucerne, Interlaken, Montreux and Geneva traveling along the Golden Pass. There is no shortage of museums, churches, parks, historic sights or activities to explore in these fascinating cities. This is a flexible vacation package. Select your number of nights in the city, desired hotel and activities. 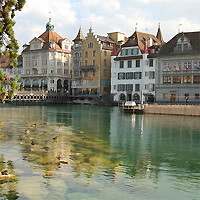 Combine Zurich, Lucerne, Bern, Interlaken and Geneva with the ICE and IR trains. The pure, unadulterated beauty of Switzerland is nearly incomparable. 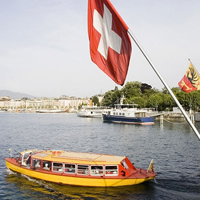 Experience the magic of this country with a totally customizable vacation package; visit Zurich (a center of culture and commerce set on a beautiful lake, with intimate, cobbled streets) and Geneva (the heavily French influenced gastronomy and bohemian districts sit alongside major hubs of global commerce). Take the train between cities to view the picturesque countryside. Combine Geneva and Lausanne with the ICE train. Paris and Geneva with the TGV Train. Paris, Grenoble, Lyon and Geneva with the TGV and Regional Trains. Take the time to enjoy this fantastic vacation package through Europe; Start your adventure in Zurich (with museums and galleries which cement the city`s status as the political and cultural capital of Switzerland) then take the train to Lucerne (a beautiful, small city with cobbled streets, frescoed houses and covered bridges) and Geneva (full of luxurious and exclusive stores; filled with parks and promenades). Take the train between cities. This is a flexible vacation package. Select your number of nights in each city, desired hotel and activities. 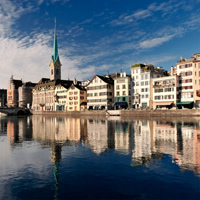 Combine Zurich, Lucerne, Bern, Lausanne and Geneva with the ICE and IR trains. 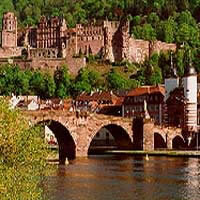 One of our top selling vacation packages in Europe! Combine fascinating, romantic cities and indulge in the impressive beauty of: Amsterdam (a history filled city, a beacon of tolerance and diversity - with charming neighborhoods set on an impressive canal system) then fly to Venice (the original city of canals with sumptuous palaces and romantic waterways); take the train to reach Geneva (home to the United Nations European headquarters and some of the world`s most recognizable luxury brands: impressive museums, parks and promenades dominate this soulful city) and last, Paris (the romantic City of Lights, home of The Louvre and incomparable French cuisine). Travel between these final cities is by train which allows you an opportunity to observe the lovely country side. This is a flexible vacation package. Select your number of nights in each city, desired hotel and activities. Combine London, Paris, Geneva, Florence and Rome with the Eurostar, TGV, EC and ES Trains. Beautifully located in the magnificent Alps, Switzerland boasts lovely towns that still preserve a rich tradition. This tour will introduce you to the highlights of the country`s diverse regions. 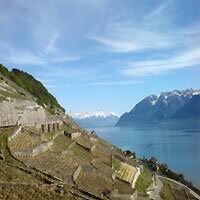 Join this escorted tour to discover Switzerland`s breathtaking scenery, living heritage and modern cities. Combine Geneva, Montreaux, Lausanne, Bern, Basel, Lucerne and Zurich with the IR and ICE Trains. Combine Zurich, St Moritz, Zermatt, Lausanne, Bern, Interlaken, Lucerne and Geneva with the IC, IR, ICE and Golden Pass Trains. Combine Zurich, St Moritz, Zermatt, Geneva, Interlaken, Lucerne and Geneva with the IC, IR, Golden Pass and ICE Trains. Arrive in beautiful Geneva (set on the banks of a lake, filled with parks and promenades, the city becomes a virtual garden in summer.) Drive to Montreux (considered the Chief resort of the Swiss Riviera), continue to Interlaken (Located at 1,900 feet above sea level, with access to some of the most spectacular skiing in the Alps, in an idyllic lakeside setting between the lakes Thun and Brienz.) and finally to Lucerne (On the north end of the Lake Lucerne within sight of Mount Pilatus and Rigi, with narrow cobblestone streets, covered bridges, frescoed houses, and fountains). This is a flexible vacation package. Select your number of nights in the city, desired hotel and activities. Arrive in beautiful Geneva (set on the banks of a lake, filled with parks and promenades, the city becomes a virtual garden in summer). Drive to Montreux (considered the Chief resort of the Swiss Riviera), continue to Interlaken (Located at 1,900 feet above sea level, with access to some of the most spectacular skiing in the Alps, in an idyllic lakeside setting between the lakes Thun and Brienz). Then on to Lucerne (On the north end of the Lake Lucerne within sight of Mount Pilatus and Rigi, with narrow cobblestone streets, covered bridges, frescoed houses, and fountains) - continue to Bern(One of the oldest and loveliest cities in Europe, with origins going back to the 12th century. It is on the UNESCO list of World Cultural Heritage) and finally, Zurich (stunningly beautiful with a charming old town where cobbled streets of the 12th-century Old Town are pristine and the blue trams run reliably). Combine Rome, Florence, Montecatini, Pisa, Genoa, Santa Margherita, Geneva, St Moritz, Zermatt, Lake Maggiore and Venice with the ES, TRN, EC, IC and TRN Trains. 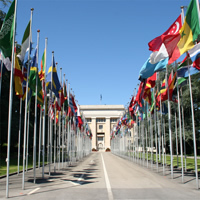 Geneva: the cosmopolitan, graceful soul of Switzerland`s French-speaking territory, a high-profile crossroads of wealth, influence and cultures from around the world. Rolls-Royces purr past manicured promenades, and grand mansions stand guard beside the River Rhone, where yachts bob and gulls dive. Spend a night in Geneva, and then pick your car and drive to Chamonix Mont Blanc (at an altitude of 3,422 ft. Skiers all over the world love its 12-mile Vallée Blanche run, the longest in Europe). Combine Geneva and Montreux with the IR train. 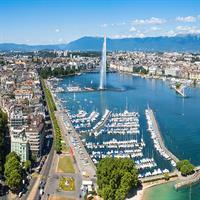 Geneva, Milan and Venice with the high speed Cisalpino and the ES Eurostar trains. Visit Vienna, Salzburg, Munich, Baden Baden, Strasbourg, Bern, Montreux and Geneva with the ICE, IC and IR Trains. Combine Salzburg, Vienna, Innsbruck, Verona, Stressa, Zermatt, Geneva, Lausanne, Bern, Interlaken, Lucerne and Zurich with the ICE, IC, TRN, EC, IR and Golden Pass Trains. Truly a great experience. The APP is wonderful!